Each liter of snow fluid will last around 3 minutes on high and around 5-10 minuets of continues light snow fall. Artificial snow fluid is sold separately and not included in the rental price.We sell the snow fluid by the liter for $12 each, $50 for 5 liters or 20 liters for $149. 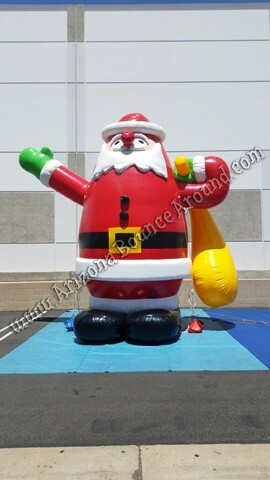 This snow blowing Santa has a 20 liter tank and uses allot of fluid. A 20 liter tank will last about 50 minutes on max output. 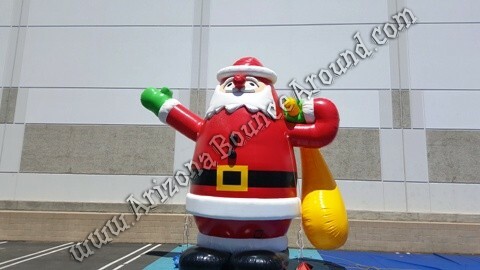 This Snow Blowing Santa can olny be found at Arizona Bounce Around.